Welcome to General Carbon’s image gallery. Descriptions are beneath the pictures. Enjoy. 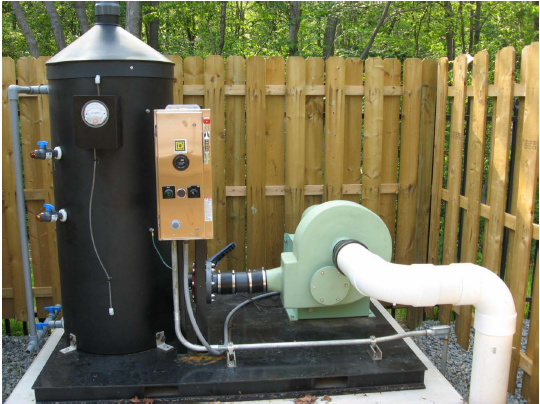 Typical installation of a four (4) foot diameter activated carbon odor control system is seen here. This unit is both economical and easy to install and maintain. 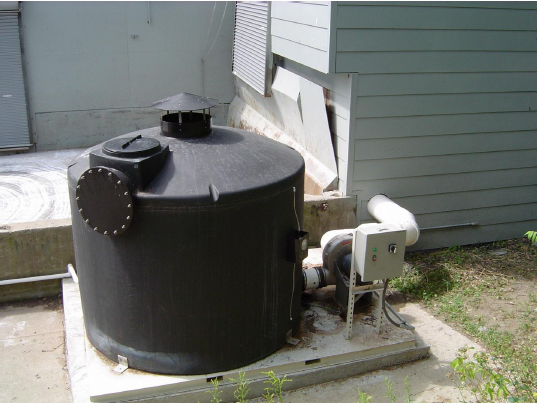 Service requirement is usually once a year activated carbon replacement. 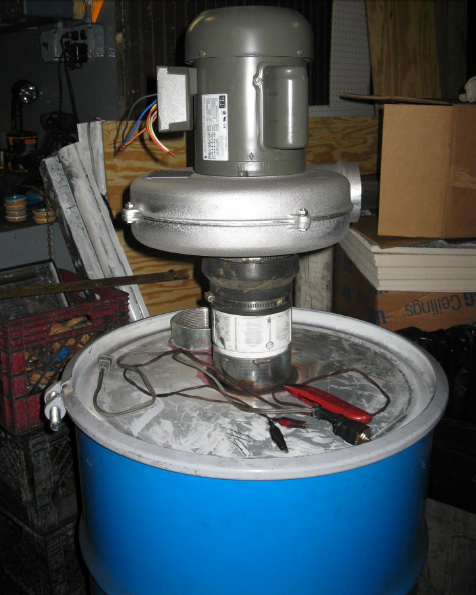 Industrial quality fans run trouble free and only require periodic greasing. 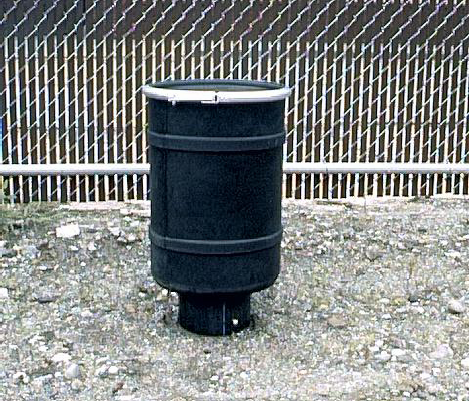 This small HDPE activated carbon adsorber treats smelly air from under a digester cover. It is designed to function with little maintenance or service requirements. Typically this unit runs between one and three years before the media needs to be replaced. 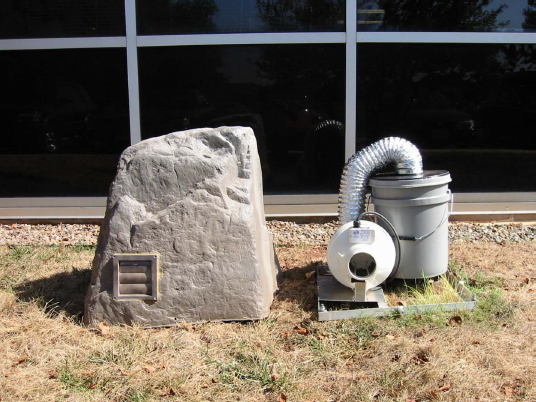 This small activated carbon treatment system treats odors from a sewer vent so that people in the immediate area cannot smell them. It is covered by a fake rock. The louvers on the rock and a gentle hum are the only giveaways. 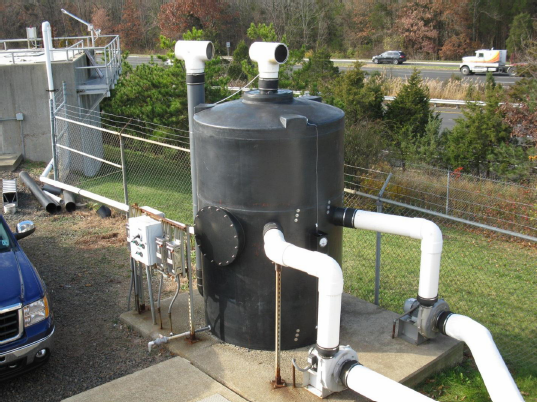 This activated carbon system treats particularly obnoxious odors through four (4) 110 gallon Air Pollution Control Barrels. The vent stream is first split in half, and then goes through a series of “lead, lag” arrangement. 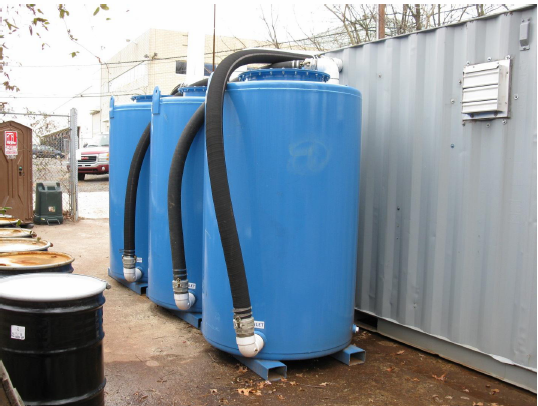 This system has plenty of activated carbon to handle the worst contamination. Three dual bed activated carbon adsorbers running in parallel. Three high quality Activated Carbon Vapor Boxes being readied for shipment. 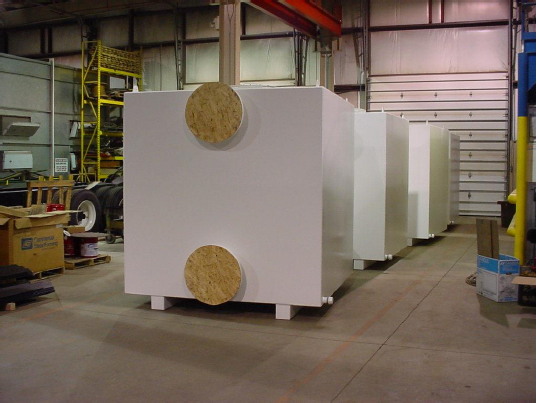 These units featured special materials and coating requirements along with periodic inspection from the client during fabrication. 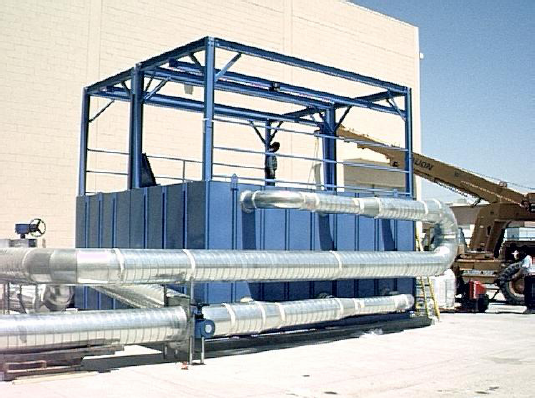 Trolley system facilitates the loading of activated carbon into large vapor boxes. 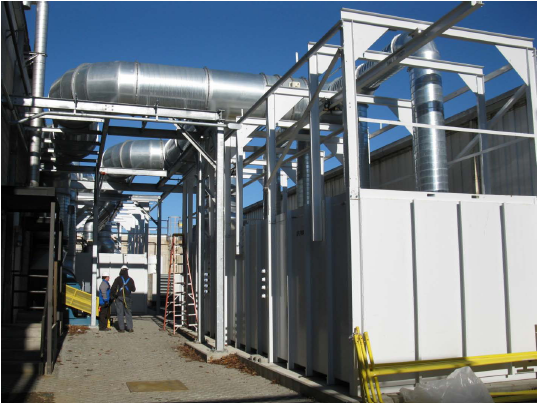 Two large activated carbon adsorber boxes treating all of the plant exhaust air. The entire system is controlled automatically with PLC and electric dampers. Maximum flow is 30,000 CFM. 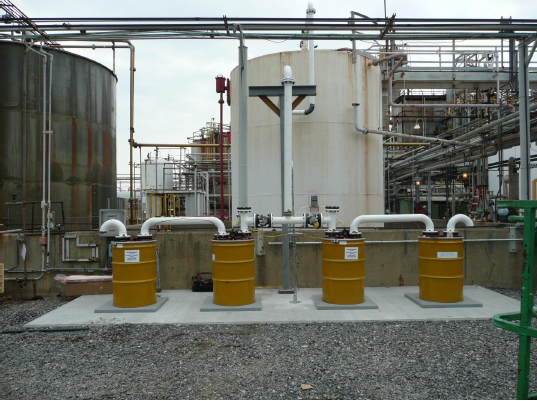 Temporary VOC control with activated carbon at an industrial facility. This is a small HDPE odor control system with an FRP fan and SS control panel. This fan has a timer circuit that turns the fan on and off at different times for the week and weekend. Premium activated carbon was installed. This is a temporary air treatment system using activated carbon. 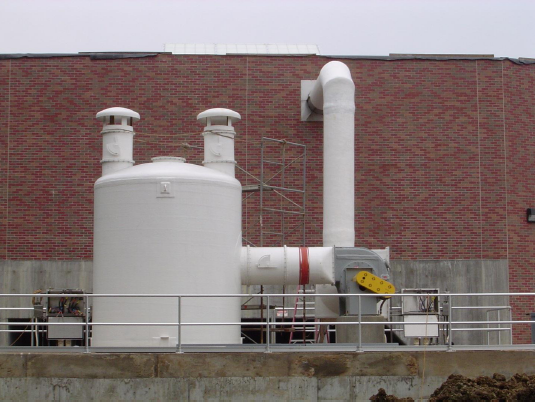 It treats air from a sewer plant digester to remove H2S and ammonia. The adsorber vessels are connected in parallel. This is a vapor phase activated carbon adsorber with a top mounted fan. 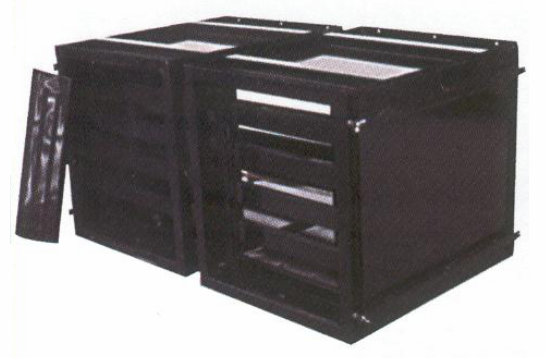 This picture is a modular activated carbon panel filter for HVAC and light vent use. The sections bolt together to treat air flows in 2,000 CFM increments. Different activated carbon can be used to treat a wide variety of odors. Units can be provided with rain hats for roof mounting. Arranged in series, they give you a “double pass” filtration system increasing the odor reduction. Multiple air adsorbers treating off gas from a soil venting system. 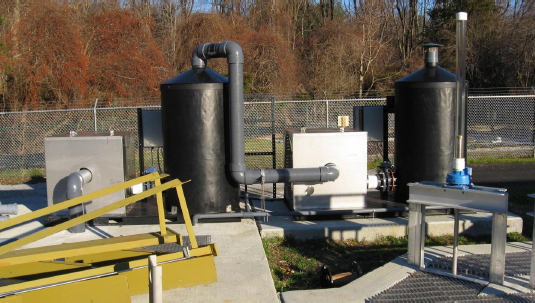 These activated carbon units are plumbed in series giving the system a long residence time to maximize the economy of using activated carbon and the removal efficiency. 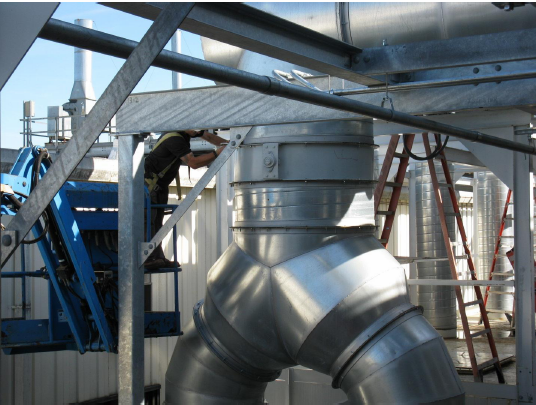 Picture of the ductwork and valves required for large ventilation projects. Good designs can be large but save money in the long run. Separate fans from different areas push odorous air into a dual bed activated carbon adsorber. Inside the vessel, half the air goes up and the other half goes down through three foot thick carbon beds. Single bed FRP activated carbon adsorber mounted on a skid with fan, control panel and dusting. 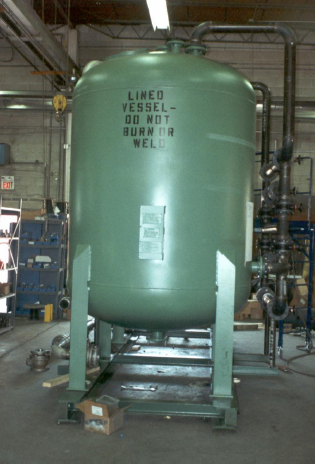 Three bed sample ports are visible on the near side of the tank. 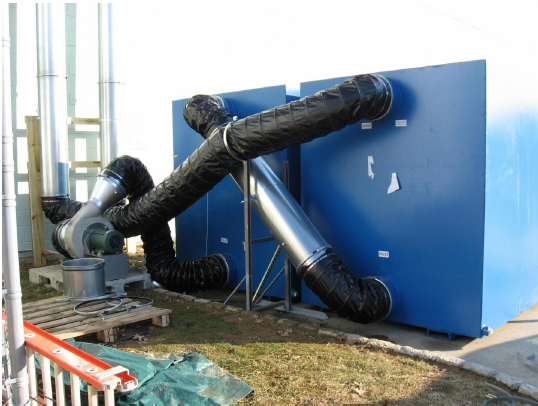 Small skid mounted odor control system using activated carbon with control panel, mist eliminator and FRP fan inside a sound enclosure. 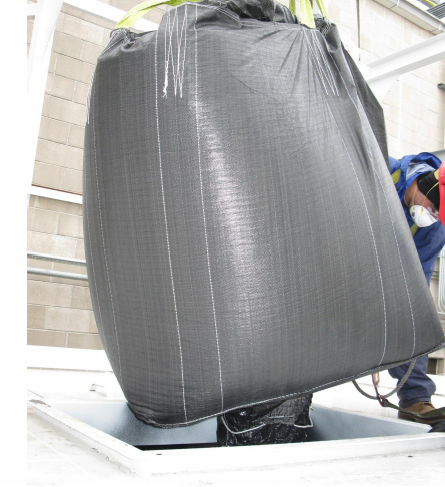 Super sacks of activated carbon make reloading vapor boxes a simple procedure. Here 1,000 lbs. of carbon is loaded in seconds via the bottom chute. 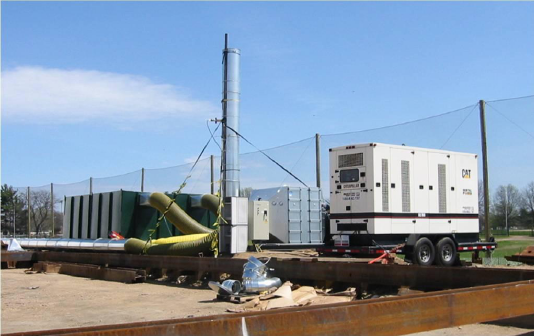 Four special vapor phase activated carbon adsorbers treat the off gas from a truck loading “rack”. 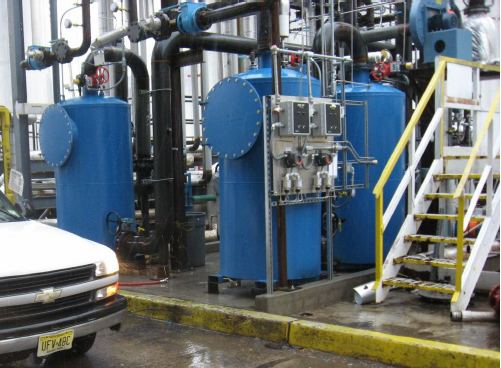 These adsorbers work in conjunction with a bioremediation system to control potentially explosive VOCs. 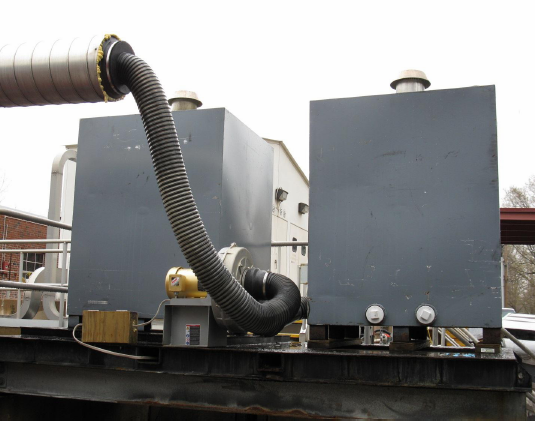 Here is a picture of twin vapor boxes that treat industrial exhaust air with activated carbon to remove noxious chemicals to meet pollution requirements. This system has valves that allow the air to run in parallel or series mode. The top trolley system makes reloading the beds simple with the use of super sacks of carbon media. The large amount of activated carbon means this system will not need changing of the lead box for two to three years. 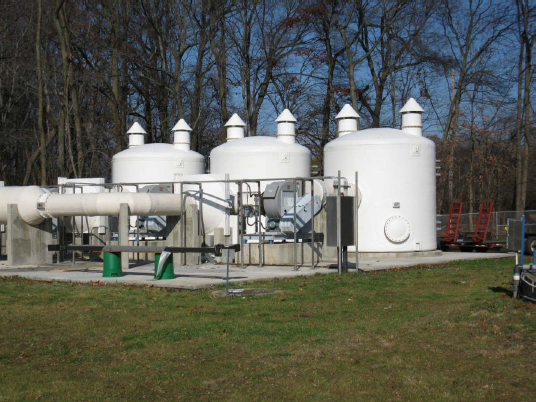 Here two liquid phase and two vapor phase activated carbon adsorbers treat the products from a dual phase recovery system. 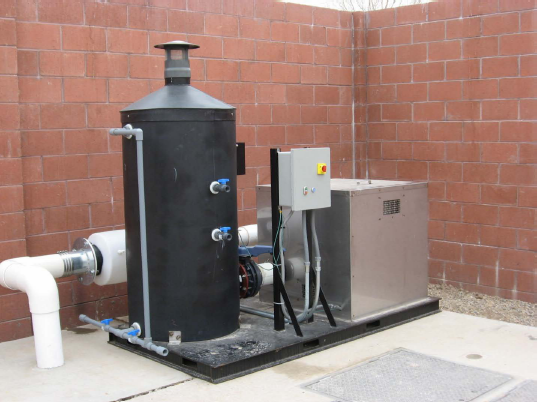 Large 86″ diameter, single bed HDPE activated carbon adsorber mounted on a steel skid with electric control panel and fan. 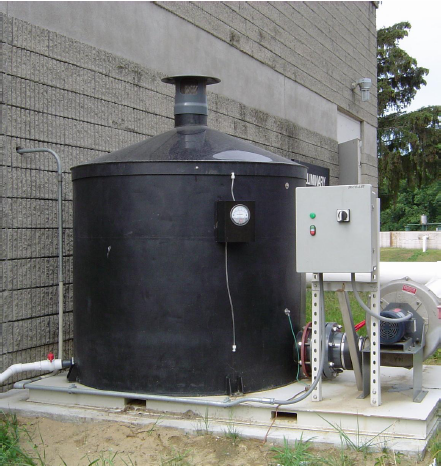 This adsorber treats air from a digester tank with premium activated carbon. 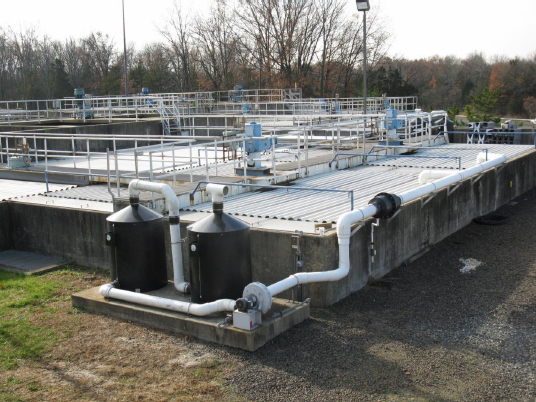 Large dual bed FRP adsorber installed at a sewer plant. 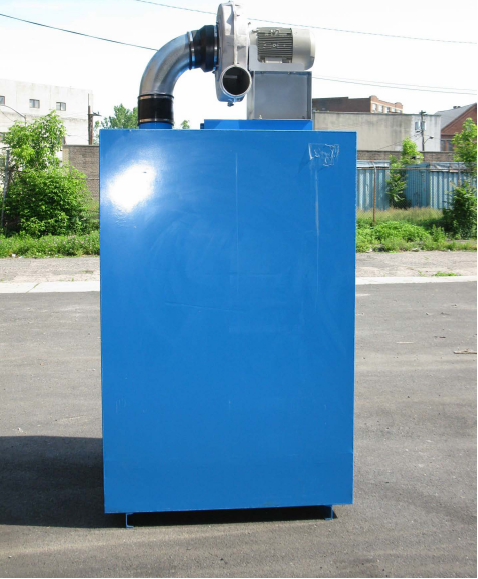 This unit vents odorous air from sludge holding area using premium activated carbon. 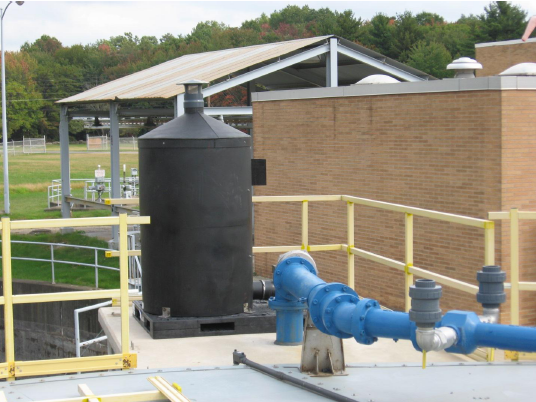 Different styles of mist/grease eliminators effectively reduce the carryover of water droplets and airborne grease that can foul the activated carbon beds of an adsorber. In cold northern climates they need to be drained frequently. Dual pass activated carbon adsorbers draw air from under a mixing tank. The moist air requires a mist eliminator to help keep efficiency high during cooler northern months. 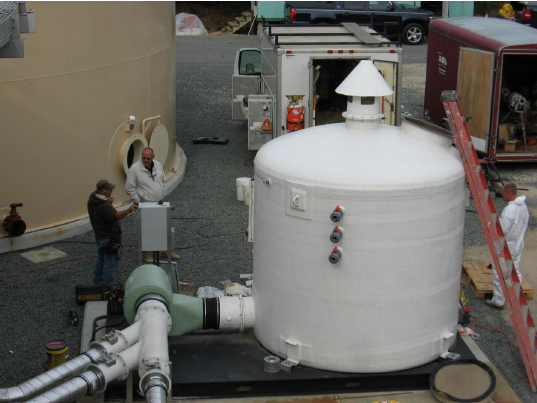 Dual pass odor control system has redundant treatment of digester off gas to insure removal of odors. 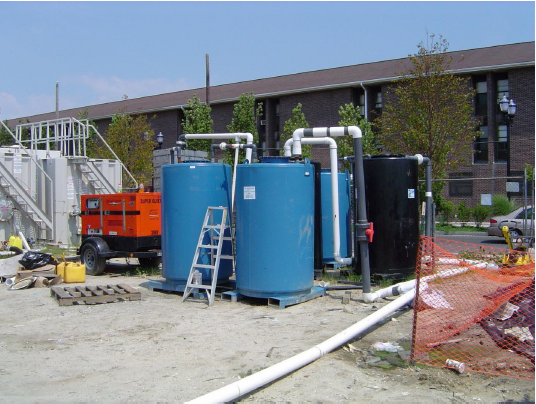 Each system features water washable activated carbon and automatic backwash operation. The fans are enclosed in sound attenuation housings to reduce any noise. 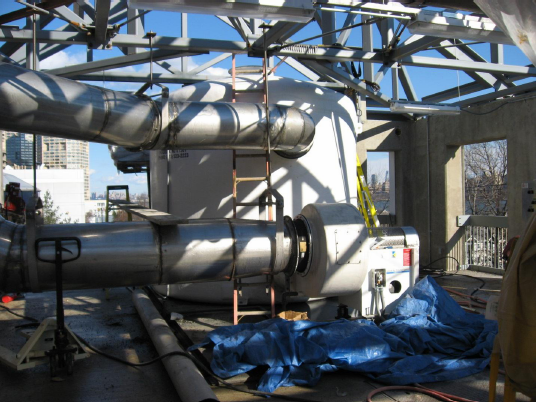 Eight (8) foot diameter FRP odor vessel mounted on the third floor of a treatment building. Limited space can result in strange mounting locations for equipment. Fortunately this unit is close to sliding doors so that service is relatively easy. 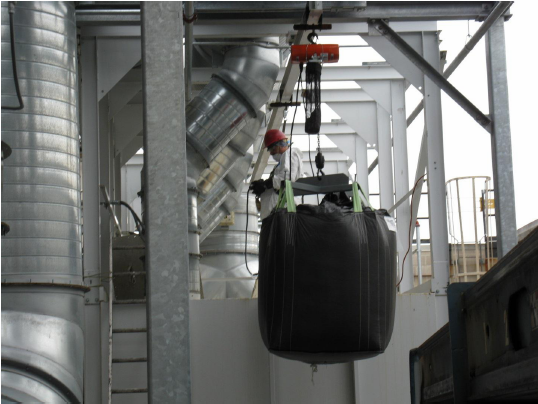 GC F-55 activated carbon air pollution barrel being tested before shipment. An HP-5000 liquid phase activated carbon adsorber ready for shipment is seen here. This vessel is ASME Sec. VIII code stamped and has stainless steel internal piping. 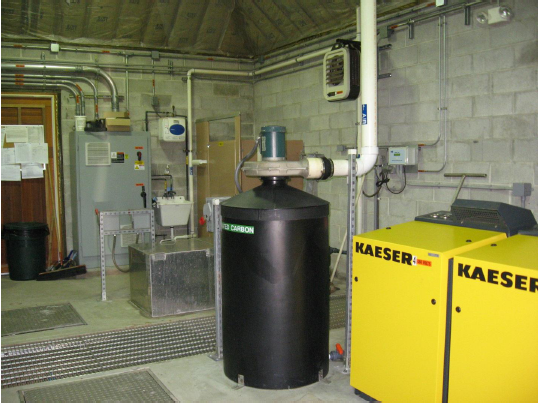 An ES-30 activated carbon system mounted inside a packaged wastewater treatment building. Top mounted fax exits to roof vent stack. Complete temporary activated carbon air treatment system for a tent enclosure runs “off the grid” with the help of a large generator. System ran 24/7 during the excavation work done inside a work tent. This small activated carbon adsorber is mounted on top of a vent pipe to stop odors from bothering people.